Though beautiful and unique, Australia’s landscape largely consists of evergreen trees. That said, you don’t have to travel to Europe or the USA to experience the magic of autumn. In fact, there are a number of places in Australia where the fiery colours and falling leaves of autumn are everything they’re cracked up to be. If there was ever a city known for its colours, it would be Orange, roughly 3.5 hours inland from Sydney. This city is filled with greenery, with the local council adding around 300 trees to the streetscape each year. Nicknamed ‘Australia’s Colour City’, there are few better places to enjoy the full spectrum of seasonal colours in Australia. 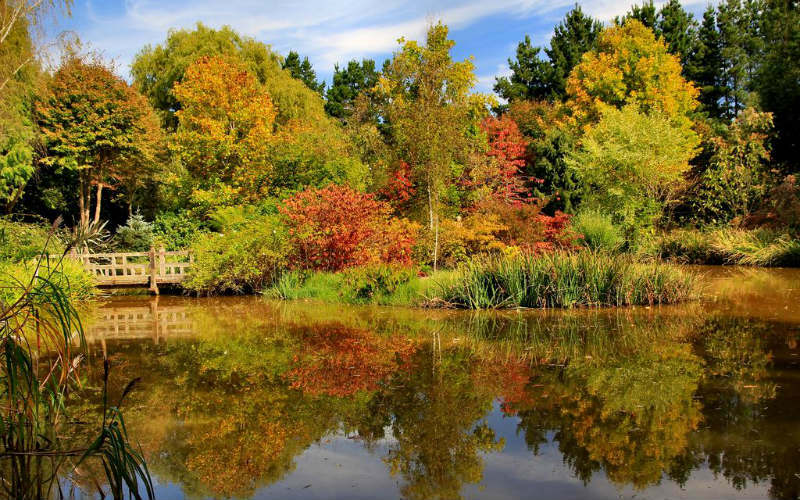 The Orange Botanic Gardens are a must-visit in autumn; explore 17 hectares of native and exotic flora, including fiery maple trees (Acer saccharum) and the orchard’s rows of red and gold apple trees. Other scenic spots include Robertson Park, Cook Park, Summer Street, Coronation Drive and Sampson Street, while the summit at Mount Lindsay Park provides a magnificent view of Orange in autumn. Orange, New South Wales. Image Credit: Visit Orange. Victoria’s High Country is dominated by the rugged mountains of the Great Dividing Range, and characterised by the quaint, gold rush-era towns that nestle around them. 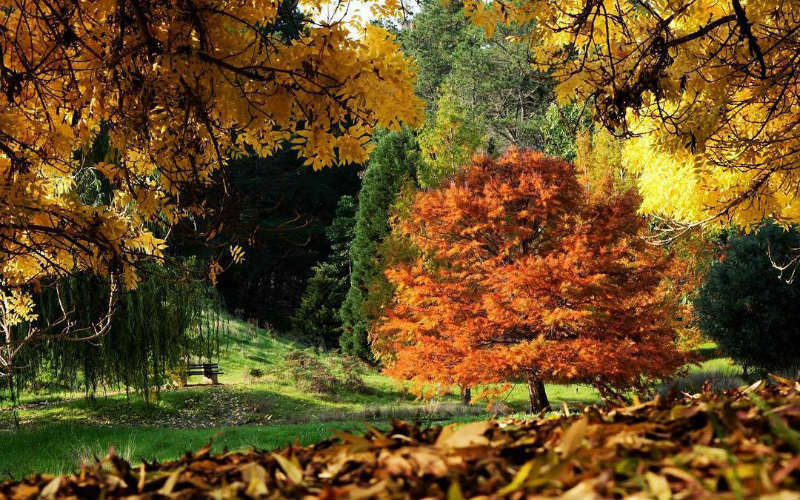 This alpine landscape puts on a stunning show during autumn, with many of its villages (such as Beechworth, Harrietville, Yackandandah, Myrtleford, Mount Beauty, Wandiligong and Bright, to name a few) undergoing incredible transformations each year. Bright is particularly popular in autumn, and even hosts a 10-day festival celebrating the colours and flavours of this season. Bright Autumn Festival is the perfect time to wander its gardens and streets, hone your photography skills, and soak up the food, music and excitement of the Gala Weekend. Bright, Victoria. Image Credit: See High Country. Roughly 3 hours south of Perth, Blackwood River Valley is an area of lush hinterland and historic towns. Many of these towns are home to incredible wildflower species and award-winning gardens, making them popular springtime destinations. However, Blackwood River Valley is also one of the best places to see Australia’s landscape turn to gold in autumn. For a scenic road trip, follow the road to Nannup and watch as the leaves change colour along the way. 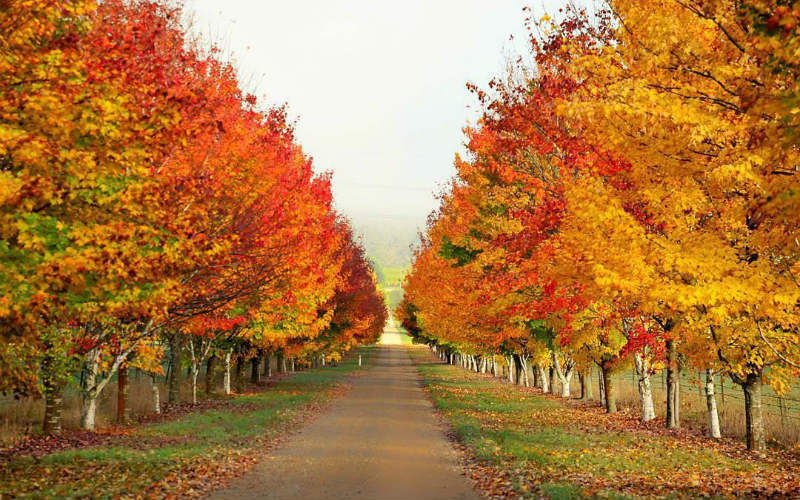 Golden Valley Tree Park, near Balingup, is perhaps the best place in Western Australia to see autumn foliage. Spanning 60 hectares, the park contains more than 3,000 native and exotic trees from over 1,000 different species. In addition to the spectacular leaves, some native trees also shed their grey bark in autumn to reveal orange and pink colours beneath. Golden Valley Tree Park, Balingup, Western Australia. Image Credit: Festival of Country Gardens. Bowral is the largest town in one of NSW’s most scenic regions: the Southern Highlands. 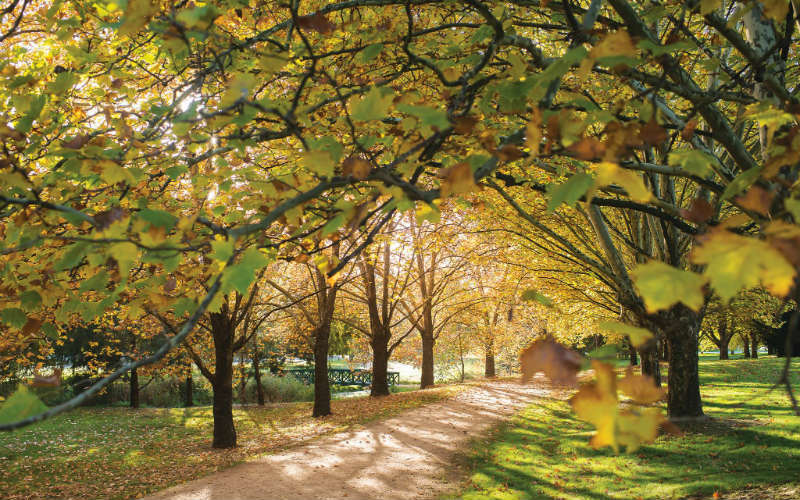 Although most famous for its tulips (which bloom dramatically in spring), there’s no denying the beauty of Bowral in autumn. In the late 19th century, Bowral became favoured among Sydney’s elite as a fashionable spot for a summer retreat. As a result, the town’s residents started planting deciduous trees to make the scenery look more British. Be sure to check the Autumn Open Gardens program for a chance to wander through some of the region’s most beautiful private gardens. Gardens open for inspection this autumn include Retford Park and Bellagio, an Italian-style garden surrounding a beautiful country estate. Bowral, New South Wales. Image Credit: Destination Southern Highlands. Berries, trees, vineyards, and rugged wilderness dominate the landscape of Australia’s coldest state. 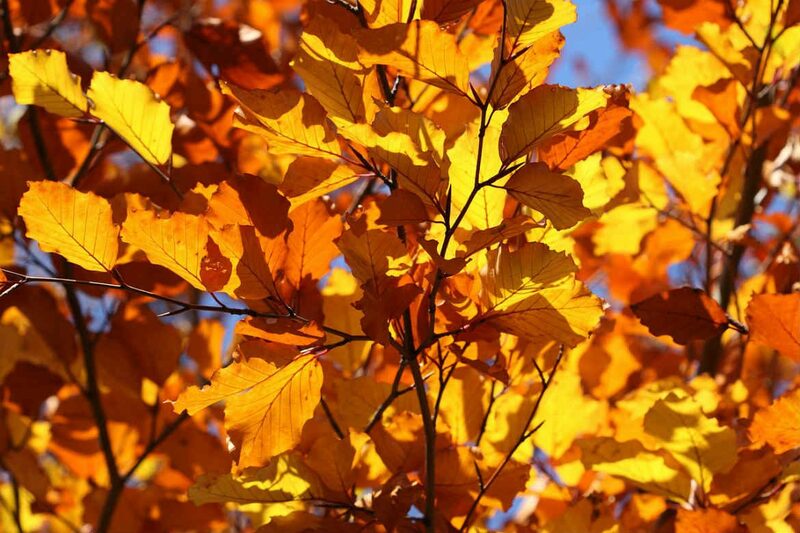 Although other states experience autumn through their introduced European trees, there’s only one native tree that sheds its leaves in anticipation of the cold: Nothofagus gunnii. Commonly called the fagus, this tree only grows in Tasmania and is responsible for much of the state’s autumn colours. 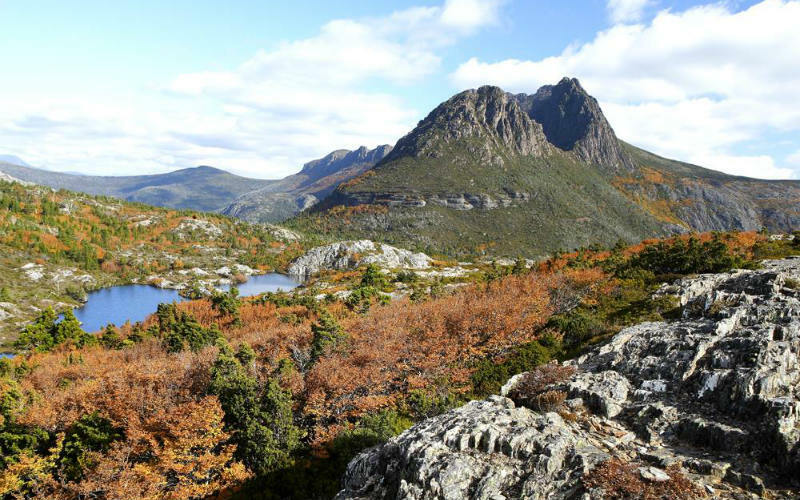 In fact, the annual eruption of reds, oranges and yellows in places like Cradle Mountain-Lake St Clair National Park and Mount Field National Park even has its own name: the Turning of the Fagus. Every April and May, this phenomenon draws hikers, photographers and tourists from all around to Tasmania’s remote highland regions. Other popular spots to see autumn foliage include towns in the Derwent Valley, and the tiny village of Ross, in the Midlands. Cradle Mountain – Lake St Clair National Park, Tasmania. Image Credit: Tasmania Parks and Wildlife Service. Already in an autumn mood? Book cheap flights to these destinations and more with Webjet!